This is an impeccable example of post-Camille construction as designed by architect Fred Wagner. Its formidable fronting to the Gulf displays nine bays and five dominant dormers. 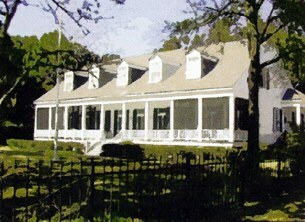 The site was that of deceased Louisiana Governor John Parker’s summer place. The landscaping is an excellent example of the enrichment of our Gulf Coast climate.